Oriental coins, which come from the countries on the Asian continent, are not always easy to identify due to the lettering system, age of coins or even odd shapes. Fortunately, there are ways to identify the coins and find out some basic information about the coins. 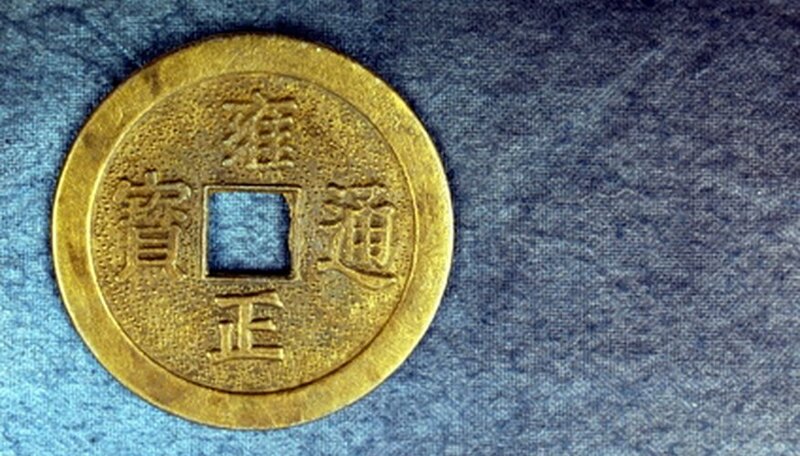 It is important to note that some Oriental charms look like coins, but they are not currency. Look for English lettering or numbers on the coins. In countries like Japan, newer coins often have numbers written them. For example, a 1-yen coin has a number 1 on it, a 50-yen coin has a 50 and a 100-yen coin has a written 100. Turn the coin over and look at both sides. Sports Tune’s "Beginner’s Guide to Oriental Coin Identification" notes that most Chinese coins will have four characters on one side and nothing on the other. Coins with two characters on one side are often older coins from China. Pay attention to any pictures. Coins with images like animals are often not currency, but charms. Coins should have written characters on the coin rather than animal pictures. Look at the characters on the coins. Coins which have only two characters rather than four are often coins which are giving a value of the coin, read from right to left. Coins with four characters are giving the name of the ruler instead of the value. Look for odd shapes. Oriental coins were not limited to round coins. There were also spade and knife coins used. Calgary Coin has examples and information about various knife and spade coins available. This can help with identification based on the appearance of the coin and the writing. It also provides and estimated value of the coins. Match up the coin writing and appearance for identification. Calgary Coin and Sports Tune each have several coin pictures and information to help identify the oriental currency.